People often ask me why wearable technology matters; perhaps the assumption being that putting blinky lights on an outfit might be a cool fad, but it doesn’t go much beyond that. Well, that’s not the whole story by far! We are currently engaged in a mobile technology revolution, but as we are also in a time of exponential technology advancement it means that the next revolution is just around the corner. There have been advancements in processing power, reductions in size, improvements in power consumption and innovations in battery technology – all of these things converging means that technology as we know it will begin to disappear, both in physical size and interface; and by doing so it will begin to integrate seamlessly and invisibly into our lives. Even now computing is shifting away from ‘devices’ and into everyday objects, and equipped with sensors these objects are beginning to gather information and provide value to our lives. Alongside the disruption of computing we’re seeing huge changes in materials – 3d printing is happening on a micrometer scale allowing for the creation of incredibly detailed weaving of plastics and metals, and many new futuristic and meta-materials are on the horizon as well – everything from light as air insulators like aerogels to products that bend light around objects. The most amazing thing of all is that these advancements are happening at once, converging on us from all directions which will inevitably lead to huge changes in the way we live and interact with the world around us. 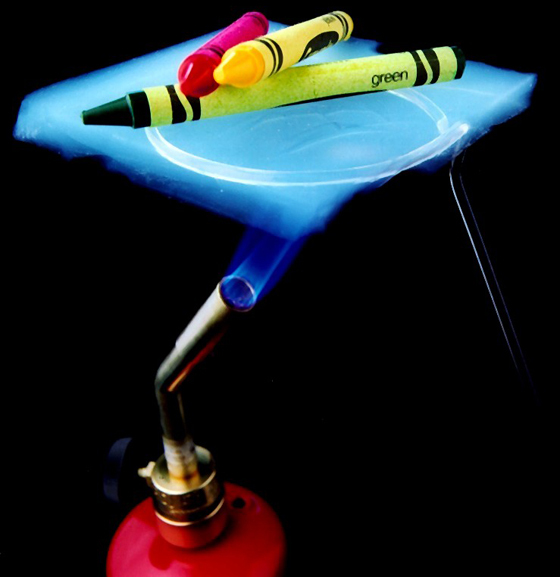 http://www.makefashion.ca/wp-content/uploads/2013/04/aerogel.crayons.jpg 577 560 shoover http://www.makefashion.ca/wp-content/uploads/2016/03/makefashion_logo.png shoover2013-04-21 12:11:202013-05-23 04:01:50Looking for Design Innovators! MakeFashion has officially launched with three workshops scheduled in July. The workshops are open to the public and offer fun, easy-to-do projects. The workshops do not require any previous experience. Each workshop offers basic materials and projects, but if you have a specific project in mind (want to re-vitalize grandma’s old jewellery or start early on your Halloween costume?) feel free to bring your ideas and extra materials. All workshops are held at Endeavor Arts, located centrally at 12th ave and 1st St SW.
*We’re moving the jewelry workshop to Protospace, but will still be meeting at Endeavor at 6pm prior to heading down. LED, batteries and a variety of lasercut jewelry kits provided. Additional kits can be purchased onsite. Purchase tickets for the jewellery making event. Make your own EL Wire hat! EL Wires, drivers and batteries are provided to get you going. Hats are provided (one size fits most!) for an additional $10, but if you have a hat you’d like to work on, please bring it! Purchase tickets for the hat making event. This shows how you can put fairly complicated EL wire patterns on large patches. The patches are made from vinyl and backed by velcro. They are intended to be removeable for washing costumes, and are connected electrically to each other. Multiple patches are combined to form a costume. Upper/lower arm, upper/lower leg, torso, shoulders, etc. 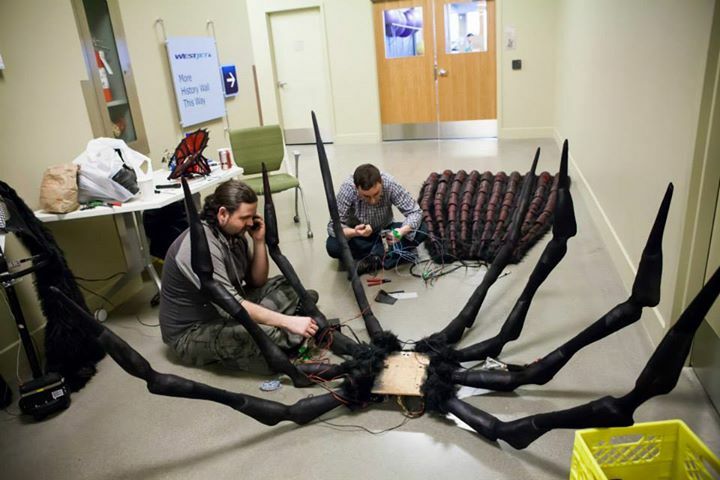 EL wire is attached using a standard sewing machine, loaded with lightweight monofilament (fishing line). EL Wire, driver, battery and patch material provided. Purchase tickets for the costume patch event. The MakeFashion launch party on June 6th was an exciting preview of the upcoming festival as well as a dialogue on the future and relevance of technology-integrated fashion. The panel, featuring Jeff de Boer, Dee Fontans, and Lara Prebster (led by event organizers Shannon Hoover and Chelsea Klukas) discussed the merging of arts and technology, the cultural significance of arts and technology, and the practical uses of technology in clothing. 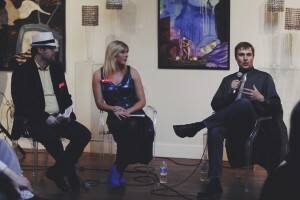 The panelists also discussed their own experiences and their vision for the future potential of fashion and technology. 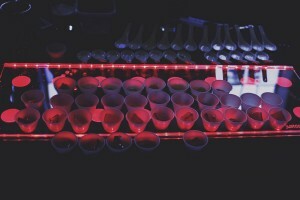 The event also featured a molecular cocktail bar by Phil Grandbois complete with smoking bourbon shots and alcoholic gelatin. 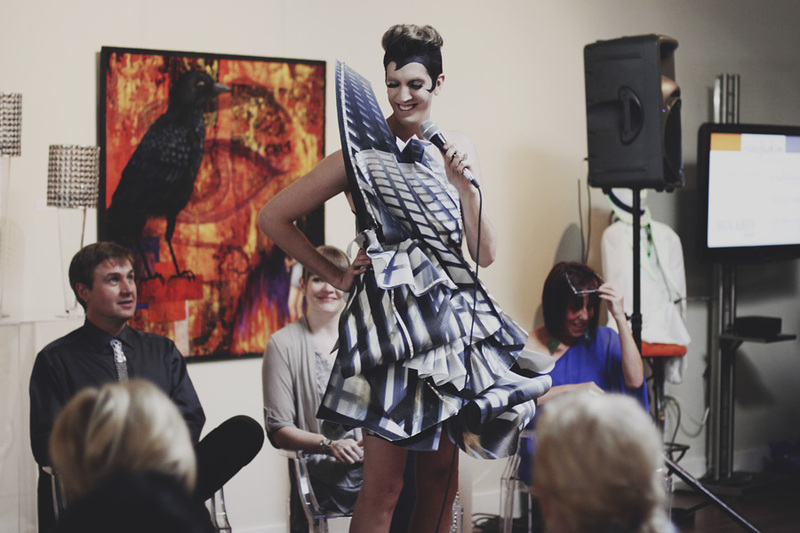 Local designer Kyle Nylund modelled a spectacular preview of the MakeFashion runway show in September. The deadline for entries has been extended to June 29th, and designers, creatives, and technology enthusiasts are encouraged to apply. Interested in contributing to MakeFashion and becoming a part of this exciting festival? MakeFashion is currently seeking sponsorships and offering packages to our sponsors, contact shoover@gmail.com for more information. View the full gallery of event photos by Faby Martin here! The designers for the MakeFashion fashion show and the public workshops will utilize a number of materials. LEDs (Light Emitting Diodes) are small, efficient light sources that can be wired or sewn into clothing. Adding micro-controllers and sensors to the mix you can have them change intensity, flash or react to external forces like sound or motion. There are a huge variety of sensors that allow electronics to react to their environment – temperature, motion, humidity, sound, range, touch and flex to name a few. The effect of LEDs can be modified with diffusers and channels. Acrylic rods are often used for this purpose, but there are hundreds of materials (including tape, feathers and fabric) that can provide an interesting effect. Micro-controllers are small, cheap computers that are often used to control wearable electronics. These range greatly from very cheap and basic to highly complex micro-computers. The most basic micro-controllers allow for sensor input and trigger effects like fade, blink or twinkle. Programming them can be as simple as selecting menu items from a drop down list on your iphone, then pointing it at your micro-controller. EL Wire (electroluminescant wire) is commonly used in costume design and as accent lighting. It provides a cool Tron-like effect and is very easy to use. While it isn’t a hard and fast limitation, EL Wire controllers typically have 2 (or so) states – on and blink. Since they require alternating current to activate, it is harder to integrate EL wire into other electronics like sensors and micro-controllers. EL Wire can be spliced and split up, but it isn’t trivial, and the controllers aren’t tiny – both issues that need to be considered in the design stage when using this product. 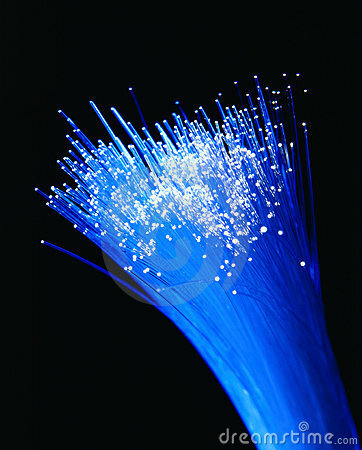 Fibre Optics provide a very pleasing, subtle light source, and can be woven into fabrics – however this is a time consuming process which results in a higher cost of these fabrics.